Bur oak (Quercus macrocarpa) is the only native oak species that is indigenous to the Guelph area. It is identified by the “bur” like protrusions on the edge of the acorn cap. Its leaf shape is variable but noted for the way the leaf ends with a large, rounded “lobe”. Look in a tree identification book for an image. Bur oak was once common in the Speed River watershed, but the forest clearing and the Guelph furniture industry, which peaked around the early 1900s, would have used most of these majestic trees. A great bur oak tree, located near Oriole Crescent on the west side of Edinburgh Road, was the subject of considerable controversy in the late 1980s. The tree was scheduled to be removed to make way for upgraded utility lines. Thanks to citizen activists, the line now crosses Edinburgh road twice, to go around this distinguished oak. In Royal City Park you can find the stump of a bur oak tree that once stood tall and quite hollow. Many will recall how you could look through it in three places around the trunk. When half the tree blew down in a wind storm years ago, the rest of the tree was cut down to the stump. A ring of young white pines now surrounds the old stump and serves as a monument to where the giant once stood. While bur oak is occasionally found along other streets and in some backyards, its numbers are in decline. A few massive, centuries old bur oaks still stand in a number of locations around Guelph. These majestic trees form a protective canopy over their surrounding neighbourhoods. In nature, old declining trees are replaced by young ones. 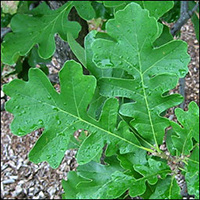 Bur oak is generally not sold in nurseries, despite the fact that it is one of the longest-lived urban trees in Ontario. Nurseries avoided these in the past because it was not considered a pretty tree (leaf colour, fall colour and flowers were all so normal!) Germinating seeds are either cut off by lawn mowing or eaten by one of the many squirrels. Protection and replacements for these great trees certainly require our help. The late Henry Kock served as Interpretive Horticulturist at The University of Guelph Arboretum from 1981 – 2005.